iTechWhiz (Mar 21, 2011)- OLED is a Flexible Plastic Display technology making use of Organic Light Emitting Diode (OLED) to produce an emission electroluminescent layer in a film of organic compounds which emit light in response to electric current. It can be used from Television screens, Computer monitors, Mobile phones, Watches to Advertising Billboards. OLEDs are also used in light sources for space illumination and in large-area light-emitting elements. OLED display functions without a backligh, making it possible to display deep black levels and can be thinner and lighter than Liquid Crystal Display (LCD). The OLED technology is used in commercial applications such as displays for mobile phones and portable digital media players, car radios and digital cameras among others. OLEDs have been used in most Motorola and Samsung colour cell phones, as well as some HTC, LG and Sony Ericsson models. Nokia has also recently introduced some OLED products including the N85 and the N86 8MP, both of which feature an AMOLED display. OLED technology can also be found in digital media players such as the Creative ZEN V, the iriver clix, the Zune HD and the Sony Walkman X Series. The Google and HTC Nexus One smartphone includes an AMOLED screen, as does HTC’s own Desire and Legend phones. However due to supply shortages of the Samsung-produced displays, certain HTC models will use Sony’s SLCD displays in the future. Hewlett Packard Computer Research and Development Labs, Palo Alto, California has demonstrated last week the New Inventions they believed would be commercialized within Three to Five years. It was a Flexible Plastic Sheet with a 50-micron thick coating that eventually could replace glass computer displays in future. HP Researchers said the screens would be rolled out to the US military this year 2011, in the form of “Solar Powered Plastic Display Wrist Watch” that could display maps, circuit, diagrams and troop positions for a Soldier. The displays uses technology similar to that of an e-book reader without glass. A larger radio device would relay maps and diagrams to troops in the field and short-range technology would transmit them from the radio to the watch. The displays are black and white, but eventually will be colour as techniques are perfected. The other candidate use of the Technology are Large plastic screen billboards. Hewlett Packard have also developed a form of 3D Telecasting called “Immersive 3D” that will telecast live events such as sports and rock concerts in 3D without a need for expensive cameras and projectors. 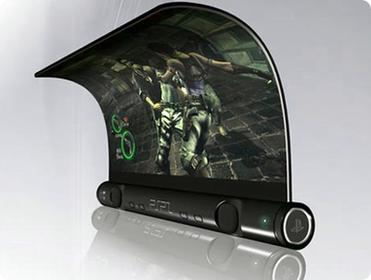 Concept Designer and Technologist, Hiromi Kiriki was strongly in believe that within Ten years, Flexible OLED Touchscreens will be common, when he proposed the desgned of “Sony Nextep”. Sony Nextep Computers are the Gadgets and Devices, those are developed to be worn as a bracelet, constructed with flexible OLED touchscreens. Earmarked for the year 2020, features like a holographic projector, with pull-out extra keyboard panels and social networking compatibility, make the concept plausible. This future computer is predict to be released to the market in 2020.